This beautiful throw looks woven but is actually crocheted in afghan stitch, using an afghan hook, which looks like a long crochet hook with a knob on the end to prevent the stitches from slipping off. 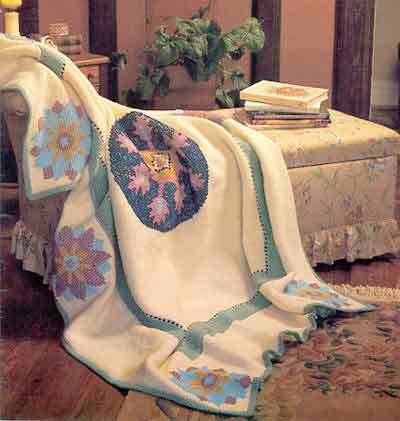 Because afghan stitch creates a grid-like pattern, it is ideal for cross stitch embroidery. The cross stitch medallions on our afghan are stitched in rich colors reminiscent of an oriental carpet, but you can substitute any colors that coordinate with your d?cor. If you enjoy afghan crochet, which is also known as Tunisian crochet, but want to try a smaller project, consider making a scarf. Approximate finished size: 62" x 76"
Gauge: 4 stitches = 1" and 7 rows = 2"
NOTE: all medallions are embroidered in cross stitch when pieces are completed. Row 1: A row of Afghan Stitch consists of 2 steps. Step 1. Work first half of row from right to left. Chain number of stitches called for. Loop on hook counts as first stitch. Draw up a loop in second chain (ch) from hook, retain on hook, * draw up on loop in next chain, retain on hook; repeat from * across. DO NOT TURN. Step 2. Work off loops as follows: Yarn over hook and draw through first loop, * yarn over hook and draw through 2 loops; repeat from * across - 1 loop remains and this loop is counted as first loop of next row. These 2 steps form Row 1. Row 2: Insert hook horizontally under second vertical bar, yarn over and draw up a loop, retain loop on hook, * insert hook horizontally under next vertical bar, yarn over and draw up a loop, retain loop on hook; repeat from * to last stitch, draw up a loop in end stitch and retain on hook. Work off loops as explained for second step of Row 1. Repeat Row 2 for Afghan Stitch. Draw up a loop in second vertical bar, draw loop just picked up through loop on hook, * draw up a loop in next vertical bar and draw through loop on hook; repeat from * across. Fasten off. With Color A and afghan hook, chain 137. Work Afghan Stitch on 137 stitches for 175 rows. Work bind-off row, making sure to keep work loose enough to remain flat. Border: Round 1: Join Color B at a corner with a slip stitch, 1 single crochet (sc) in corner, * sc along one edge to next corner, 3 sc in corner, repeat from * 2 times more, end sc along fourth side, work 2 sc in starting corner, join with a slip stitch, ch 1. DO NOT TURN. NOTE: Make sure corresponding sides have same number of stitches and that work is flat. Repeat Round 1 for 9 times more. Fasten off. Embroider Medallions for Center Panel. 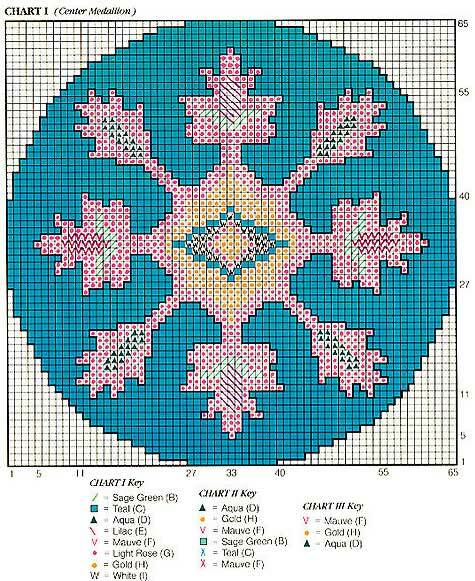 See diagram for cross stitch. Embroider Cross Stitch in Color C around inner edge of Center Panel next to first row of Color B alt="" border. Make sure to have same number of cross stitch on corresponding sides. Embroider cross stitch around 4 sides with Color F on the 9th round of Color B alt="" border. 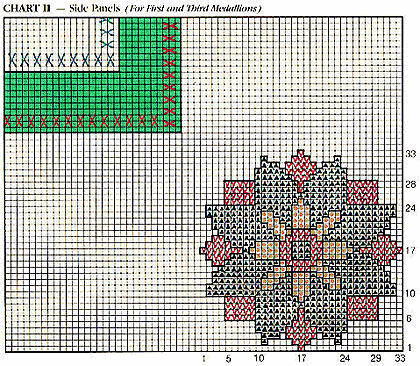 Make sure to have same number of cross stitches on corresponding sides. Side panels are worked in 2 parts, a right and left side, then seamed in the center. With Color A, ch 116. Work in afghan stitch on 116 stitches for 28 rows. Next row: Work the first 36 stitches, join a second ball and bind-off the remaining 80 stitches loosely. Fasten off second ball. Work even on the 36 stitches for 198 rows, or length needed to fit side edge of Center Panel, from one corner to the next corner. Next Row: Pick up the 36 stitches, join a second ball and chain 80. Fasten off second ball and with the first ball pick up a stitch in each chain-116 stitches. Work even for 27 rows more. Embroider three medallions following chart. Start first Medallion on the second row from lower edge and at the widest point it should be worked on the second stitch from edge. Place third medallion to correspond to first, then center second medallion. With Color A, chain 116. Work in afghan stitch for 28 rows. Next row: Bind off 80 stitches, work over remaining 36 stitches. Work even on the 36 stitches, until same length as Left Side. Fasten off. Next row: Chain 80 and pick up 80 stitches on the chain, work across the 36 stitches-116 stitches. Finish as for Left Side. Embroider the three Medallions to correspond to Left Side. Weave top and bottom panels at center to form a frame. With I crochet hook, work along inner edge of frame. Join color A in first stitch after corner. Chain 1 and * work in sc along inner edge to within 1 stitch before next corner, work a corner decrease (draw up a loop in each of 2 stitches, yarn over and draw through all loops on hook); repeat from * 3 times more. Make sure work is flat and corresponding sides have same number of stitches. Fasten off. Attach frame to center panel, joining with Color A from the back with a slip stitch. Be careful not to draw in. Round 1: Join color B to any corner, With I crochet hook, right side facing, chain 1 and work in sc around outer edge, working 3 sc in each corner. Make sure work is flat and corresponding sides have same number of stitches. Join with a slip stitch, chain 1, turn. Round 3: With right side facing, working backwards from left to right, single crochet in each stitch. Join with a slip stitch. Fasten off.